Here’s the thing about historical dramas: they’re not documentaries. Factual liberties are going to be taken by filmmakers searching for the right mix of and accuracy and emotional punch. The Imitation Game is one that almost scores a knockout. It manages to be both an exciting historical mystery and a heartfelt look into the complicated soul at its center. 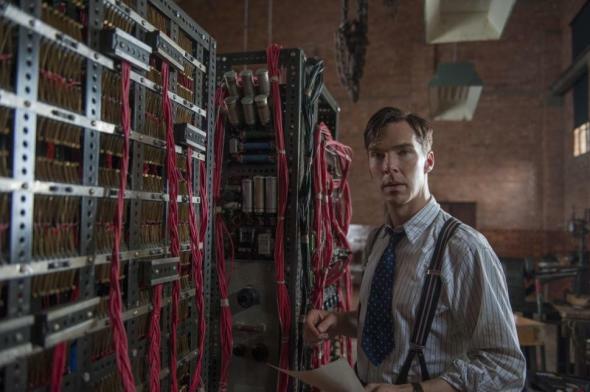 Benedict Cumberbatch is Oscar-worthy as Alan Turing, the English mathematician and all-around brilliant thinker who played a major role in cracking the Nazi’s “unbreakable” Enigma code during World War II. Director Morton Tyldum (the underseen 2011 Norwegian gem Headhunters) expertly weaves the breathless quest by Turing and his team of code breakers together with Turing’s personal journey of loneliness and longing. Set designs that appear too tidy for 1940s wartime are negated by Tyldum’s impeccable sense of pacing, as he simultaneously builds the tension in both plot lines while steering clear of excess melodrama. He’s blessed with an impressive debut screenplay from Graham Moore, adapting Andrew Hodges’ book “Alan Turing: the Enigma”. This is a film about secrets of all kinds, and Moore’s taut, nuanced script covers all angles in exploring their wages. Cumberbatch leads the stellar ensemble cast with a wondrous turn. He presents Turing as a complex, unique individual blessed with an exceptional mind and a puzzling personality. Is it a dead-on reflection of the actual Alan Turing? I doubt it, but it is a multi-dimensional performance that any “based on true events” film would be lucky to have driving it. Keira Knightley shines as Turing’s teammate and eventual fiancé Joan Clarke, subtlety creating a brilliant, outgoing personality where Turing finds comfort. Kudos, too, to Charles Dance and Mark Strong, both able to make lasting impressions with limited screen time as Turing’s superior officers. As the human drama and the historical heroics both come to weighty conclusions, the film pulls back right when it might have cemented itself as truly unforgettable. Erring on the side of understatement is certainly the safe way home, but still disappointing. After Turing’s repeated pleas to pay attention, shying away from the tough questions raised leaves a film filled with logic feeling a touch too calculated. Do You Want to Build a Sequel?